When someone says Cape Town – the words beaches, vacation, models, seafood, postcard pictures and endless coastlines might be some of the common words that may ring in. But African Penguins..no no. That’s why when I read about Boulders Beach, I was ecstatic like how. It’s a different feeling to see penguins at a zoo, vs. in their natural habitat which is what Boulders Beach is all about. Quite recently. 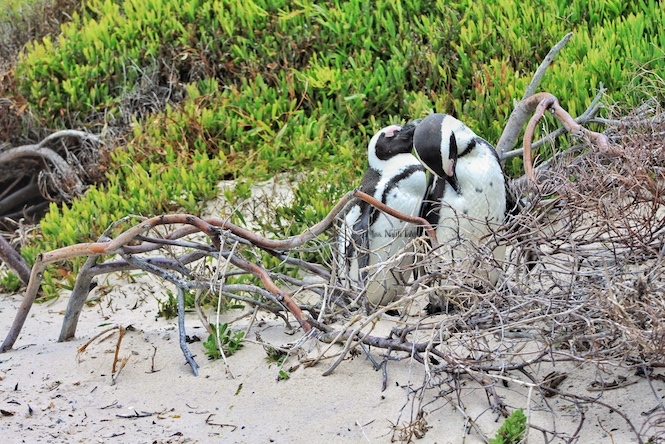 In 1982, two breeding pairs of tuxedo dressed penguins landed at Boulders Beach. Initially, their colony grew rapidly because of the abundance of food all around. But off late what with commercial fishing and pollution all around, their numbers started dwindling. In fact, there used to be almost more than a million African Penguins in Cape Town till about a century back. Unfortunately, now there are only 25000 of them left in the whole world. In the whole of Africa, Boulders Beach is one of the few places which is their home, and we get to visit them right in the middle of their natural habitat. Quite awesome isn’t it? Formerly known as Jackass Penguins ! Someone really thought it through to come up with this name. But I get it after visiting this place. They are noisy birds, and the reason they were named jackass penguins was because of their constant distinctive braying. There is just no ignoring it. The Penguins live in a residential area ! Talk about some lucky humans ! The area around the beach has residential houses. I cannot even begin to imagine their lucky stars. To wake up every single morning to a view of African Penguins. I would give up a kidney for that. Ok, maybe not. What is this Boulder’s Beach all about? The area has granite boulders all around, protecting the location from strong winds and large waves. It also has beautiful sandy beaches and nooks and corners for penguins to settle in. Apparently the boulders at this beach date back to a whopping 540 million years ago. That’s ancient ! The boulders and its surrounding beaches are now part of the Table Mountain National Park Marine Protected Area which is helping to protect the endangered African Penguins. Just a few years back, and luckily for all of us, they have also made boardwalks for tourists to come right up close to the penguins. It is almost like you can touch the birds, but it’s frowned upon. Both by the authorities and the penguins. They can really give a bad peck with their razor sharp beaks, so try not to get too close, if you know what I mean. All throughout the park, penguins are the boss. You will notice them almost anywhere and everywhere, and some of them know how to pose. With time, they have gotten used to people adoring them with their cameras and flashlights. Some of them immediately stand up in attention almost looking like they are posing for you. It’s quite comic to look at them.